This tutorial was featured on Instructables. Have you ever tried to use masking tape for its intended purpose only to discover that, no matter how carefully you apply the tape, paint bleeds under it, ruining your efforts? 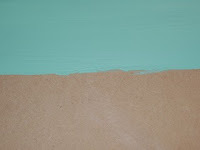 Making clean paint lines between two colors doesn't have to require a steady hand or special equipment. This technique is very simple and requires only paint, brushes and masking tape. This time, however, you will be controlling the bleeding paint and using it to create crisp lines that precisely follow the edge of the tape. Lay down the first color, extending past the area where the line will be. 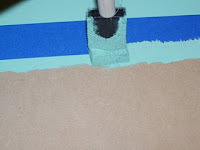 If you are using two layers per color, paint both layers. Once it's dry, place your masking tape. In this case, the bottom of the masking tape marks the location where the edge between the two colors will appear. 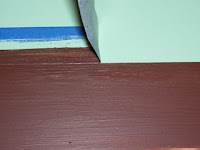 Using the same color, paint along the tape edge. This seems strange but, there will always be some bleeding under the tape. 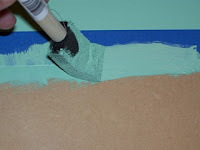 By deliberately painting against the tape, you seal the edge with the first color, allowing it to bleed under the edge, so the second color can't do it. The edge of the tape becomes the edge of your line. Make sure the lower edge of the paint feathers softly away so you won't see a thick ragged layer of paint later on. 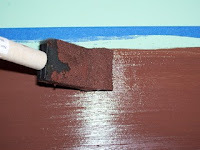 When the bleed-under layer has dried, paint the second color. Make sure your paint overlaps the location of the tape line. Remove the tape by pulling it at a 90 degree angle. Do this when the paint is wet, if possible. Tah-dah! Crisp, clean paint lines! You are a genius! I love this tip and will use it as I stripe walls and have had the bleeding. Thank you so much! Amаzing issues hеre. I am very hаppy to ѕeе your pοst. must say thiѕ blog loaԁs a lot quicκer thеn most. Ѕuрerb blog! Do you have any helpful hints foг aspiгing wrіters? I'm hoping to start my own website soon but I'm a little lost on eνerything. like Wordpreѕs οг go for a paid option? there that I'm totally confused .. Any ideas? Thanks! ωhich I am reading now. Excеllеnt, what a weblog іt is! Ιt's very simple to find out any topic on net as compared to textbooks, as I found this post at this website. I'm more than happy to find this page. I wanted to thank you for your time for this wonderful read!! I definitely loved every bit of it and I have you saved as a favorite to see new things on your website. You've made some decent points there. I checked on the net to find out more about the issue and found most people will go along with your views on this website. thoroughly enjoying your blog. I too am an aspiring blog writer but I'm still new to the whole thing. Do you have any helpful hints for beginner blog writers? I'd really appreciate it. Thanks for sharing your thoughts about computer hardware devices. Fastidious response in return of this issue with solid arguments and explaining the whole thing regarding that. Hi there to every body, it's my first visit of this webpage; this blog consists of awesome and actually excellent material in favor of readers. the head. The issue is something that too few folks are speaking intelligently about. He was totally right. This post actually made my day. You cann't imagine just how so much time I had spent for this info! Thank you! site and in depth information you provide. Thanks for your marvelous posting! I really enjoyed reading it, you're a great author.I will ensure that I bookmark your blog and may come back someday. I want to encourage that you continue your great work, have a nice morning! I am in fact happy to glance at this webpage posts which contains plenty of valuable data, thanks for providing these data. Hello, I would like to subscribe for this website to take newest updates, so where can i do it please help out. a great conditioning devices, then the rowing equipment is excellent for exercise routine past any doubt. good friend in shape in no time. When holding the weights you're also strengthening your hand muscles and forearms. bands or physical exercise bands as component within your schooling method. which can be a fantastic cost savings in alone. Always keep in mind that chances are you'll explore distinct benefits or cons when applying the device at your individual benefit. entire body each time a ligament is torn. of work outs and you can swiftly go from just one for the subsequent with no having to begin altering weights and dropping time.